If I were President of the United States, or, more realistically, if Ron or Rand Paul were, and they appointed me Secretary of Defense, or Secretary of State, this is how I would deal with Kim Jong-un and the North Korean situation. First, realize that Un’s theatrics are, from his own point of view, perfectly rational. He is not stupid. He looks at what happened to Muammar Gaddafi of Libya; murdered by mobs after kow-towing to the Great Satan. He notes the demise of Saddam Hussain of Iraq, another country that got on the wrong side of our imperialist nation; a similar dismal end befell him, too. It does not take much brain power to realize that Un’s only hope of escaping a similar fate would be, roughly, the one he has adopted: belligerence, nuclear armament, bellicosity, etc. Here is what to do about the situation. Withdraw some 35,000 U.S. troops from the demilitarized zone, separating North and South Korea. What in bloody blue blazes are they doing there in the first place? Is not the Korean War of 1951 yet drawing to a close? Sign a formal agreement, a treaty, a contract, with, yes, North Korea, ending the unconstitutional, undeclared “police action” of 1950. This never should have been started in the first place. It is time, it is past time, to end it. Stop opposing any and all attempts of the two Koreas to unify with one another, perhaps along similar lines established by East and West Germany. What business is it of the U.S. what happens in that far away land? Ordinarily, I favor as many countries as possible. Seven billion plus is my ultimate goal, one for each of us. Certainly I support the secession of Catalonia, Quebec and any other breakaway province (or state! California: best of luck to you people in this regard). But, I am willing to make an exception in this one instance. In any case, this should be up, entirely, to Koreans, and the U.S. should take its big fat thumb out of this process. Open up a U.S. Embassy in Pyongyang. If we want peace with the Hermit Kingdom, this is a necessary step. As it happens, I oppose all such institutions. Maybe, perhaps, just possibly, they had some sort of legitimate function in a bygone day. But nowadays, in an era of electronic communications, they are not needed. We should not only pull all U.S. troops back to our own soil, but do this for diplomats as well. With one exception: North Korea. Yes, a U.S. embassy there would be an act of good faith. After relations between the two countries have normalized, then and only then would it be a proper moment to shut that one down too. Appoint Dennis Rodman U.S. Ambassador to North Korea. This sounds silly, but I am deadly serious about it. Yes, yes, get some career diplomats to assist him in dotting the I’s and crossing the T’s. But, it is difficult to think of a more friendly gesture than that. Well, here is another one. Maybe it is not all that problematic to think of something along these kindly lines. Stop those “War Games” between the U.S. and South Korea, which take place all over the neighborhood, east and west of North Korea, north and south of it, over and possibly under it too. How would we like it if a foreign power played “War Games” in our locality? We would not be too fond of it, I imagine. The U.S. established a “Monroe Doctrine” to keep foreign powers away from our doorstep. Does any rational person doubt that other countries, too, would like to establish a cordon sanitaire around themselves as well? Announce a unilateral declaration of free trade between the U.S. and North Korea. According to that old aphorism, if goods do not cross national borders, armies will. Does not the U.S. now have enough ongoing undeclared wars all over the place? Hot ones in the Middle East and Afghanistan, Cold ones with Russia, China, Iran, etc. Do we really need this potentially nuclear conflagration with North Korea as well? And while we’re at it, stop with this craziness with China. Yes, we have a balance of trade deficit with the Middle Kingdom. I’ve got a horrid record with Wal-Mart and McDonald’s. They don’t buy a penny of my services, ever, and I purchase goods from them all the time. What of it? Insofar as unilateral declarations of free trade is concerned, yes, North Korea first, and then, five minutes later, with every other nation on the planet. Why is it so important that we sort out this outrageous situation with North Korea? Why is this perhaps more imperative than regularized relations with other parts of the world into which the U.S. has stuck its ugly proboscis? Kim Jong-un is less stable than the leaders of other countries we have invaded, or threatened. He has nuclear capabilities, and a fast developing delivery system. A mistake would annihilate the people of that poor country, and, perhaps, horribly, those of an American city. This is not the time, if ever there was, for threats, bombast, belligerence, which has been hurled in both directions. This is the time for the adults to take charge. No, it is long past that time. Dennis, are you down with this? Dr. Block [send him mail] is a professor of economics at Loyola University New Orleans, and a senior fellow of the Ludwig von Mises Institute. He is the author of Defending the Undefendable, The Case for Discrimination, Labor Economics From A Free Market Perspective, Building Blocks for Liberty, Differing Worldviews in Higher Education, and The Privatization of Roads and Highways. All good suggestions. But here's the big one... Tell Kim he can have front row (or box) to any NBA game he wants. Tell him we want him to come and enjoy basketball with us. In return, he just has to stop messing with nukes. Easy peasey. Walter "Moderate" Block, defending the defendable. Sadly, he is really just offending the undefendable (people) here. 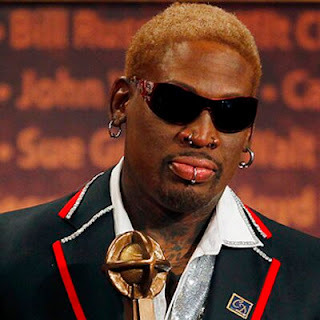 Luke Rudkowski of We Are Change has been saying something similar about Dennis Rodman. And Rodman himself has offered to be a liaison.